The no. 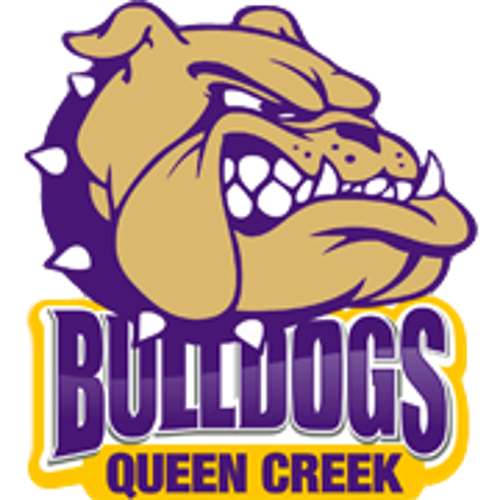 7 Queen Creek High School football team played in its inaugural 6A state playoff game on Friday against no. 10 Red Mountain at home, losing a thriller late to the Mountain Lions. After trailing 30-14 with less than 11 minutes in the game, the Dogs put their heads down and scored back-to-back-to-back touchdowns to take the 34-30 lead. 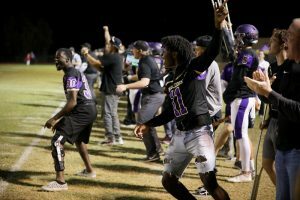 Following QC’s late-game heroics, Red Mountain had some of their own on a 60-yard play that resulted in the eventual game-winning touchdown with just over a minute left on the clock. The first half was relatively quiet as both teams scored just one touchdown. 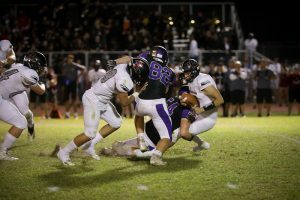 Red Mountain scored on its opening drive to take the initial lead, but fell into trouble with the Bulldog defense. QC’s first possession of the game was lackluster, but the defense would give them a good chance to tie the game after Fritzny Niclasse intercepted the ball on RM’s own 18-yd line. QC did take advantage, eventually running it in for an 8-yd touchdown from Jace Bond. On its next possession, Red Mountain fumbled the ball, giving it right back to QC at midfield. The Dogs couldn’t convert and punted the ball away. The QC defense went right back to work, forcing a three and out and giving the offense good field position. The drive for QC ended on the 3-yd line, where they elected to kick the field goal, which was no good, holding the score at 7-7 heading into the half. QC scored to open the second half with a touchdown on a 65-yard reception from Trey Reynolds to Jace Bond for his second score of the night. The lead was short-lived for the Dogs as Red Mountain went on to score 17 points in just under three minutes and take a 30-14 lead heading into the fourth quarter. In the final 10 minutes of the game, QC scored first on a run from Jace Bond, for his third TD of the night. QC attempted a two-point conversion, which failed. On Red Mountain’s next drive, QC forced an errant snap on the punt and took advantage of field position on the 25-yard line to score its second touchdown of the quarter on a 1-yd run from Reynolds. 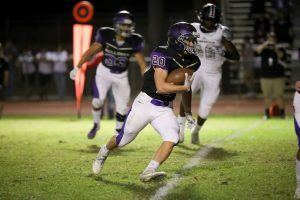 QC trailed 30-27 with 5:05 left in the game and one play into Red Mountain’s next possession, Justin Prigge intercepted the Mountain Lion QB at their own 36-yd line. Dylan Borja and Trey Reynolds combined to run the rest of the way and give QC the 34-30 lead with just 3:26 to go. When all seemed lost for Red Mountain, backed up on their own 40-yd line and on a 1st & 24, a 60-yard pass was pulled down for a touchdown that completely sucked the wind right out of QC’s sails. The Dogs had just 1:07 to try to get within range to try and kick a game-tying field goal. On a 1st & 15, Reynolds scrambled to try to avoid a sac, but was intercepted with just 23 seconds to go. Red Mountain knelt the ball to take the 37-34 win, following an amazing comeback by both teams. Schureman acknowledged how lucky he and his team are to be a part of the Queen Creek program. In their first year in 6A, the Dogs felt they had a lot to prove and with one of the toughest schedules in the state, they had just the chance. 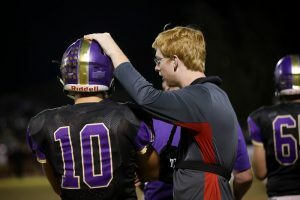 They faced a lot of adversity, losing their last two games of the season and their starting quarterback, but they proved to everyone along the way that they belong with the best in the state.